We are pleased to be able to share details with you of the July upgrade to EROAD's Depot web service. The upgrade took place at 10pm NZDT (Thursday 9 July 2015). It’s easy to forget about fixing that chip on Bob’s windscreen or checking that loose mudguard on Kevin’s truck, even if these findings are recorded on a driver inspection report. In order to enable you to record and track all these tasks in one space we have extended our Service Module. Now you can add these vehicle maintenance tasks in Depot, view outstanding tasks when scheduling a Service and tick them off on completion. 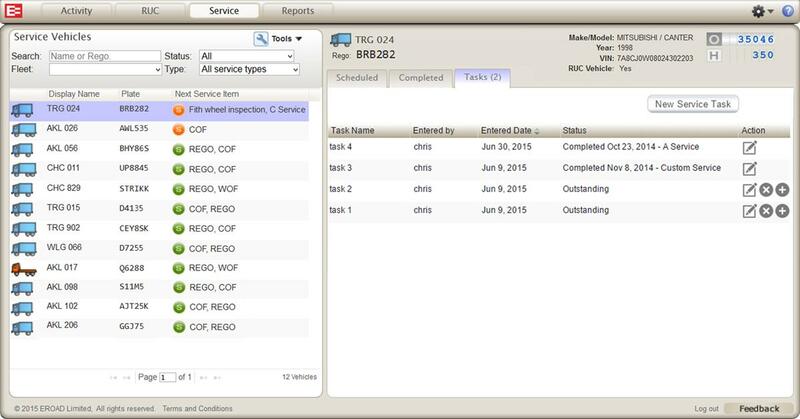 Keep a full Service record of tasks performed on your vehicles in Depot to help you meet your vehicle maintenance audit obligations. Easy and accessible 24/7. Please refer to our help site for detailed information on how to manage Service tasks.